Pine River Breaks Provincial Park with its open grassland hillsides protects a scenic landscape along the Pine River. Mixed forests of trembling aspen and spruce provide shelter for mule deer and other ungulates, especially in winter. Visitors to this unique area can access it via a short hike from the Sundance Pit Road or by boat along the Pine River. 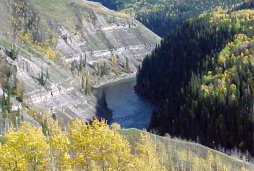 Pine River Breaks Provincial Park is located on the north side of the Pine River, approximately halfway between the District of Chetwynd and East Pine River, near Sundance Lakes on Highway 97. The site is several kilometres north of Mount Wartenbe in the extreme southern portion of the Peace Lowlands. Access is via Highway 97, and south at Sundance Lakes along a trail through private property (L813), or through Sundance Pit Road that leads towards a trail on crown land and into the park. Visitors can also access the area by using the boat launch located at East Pine Provincial Park and boating up the Pine River. Cultural Heritage - First Nations of the Treaty 8 Tribal Association have traditionally used the area. Conservation - Pine River Breaks Provincial Park is located in the Peace Lowlands ecosection on the south facing side of the Pine River. This area protects important wildlife wintering habitat, especially for ungulates. The park also protects an unusual assemblage of glacial landforms complete with esker formations and kettle ponds. Wildlife - Wildlife found in the park includes mule deer, white-tailed deer, moose, coyote and the occasional black bear. Approved Purpose Statement and Zoning Plan [PDF 2.27MB] for Pine River Breaks Provincial Park is available online in pdf format. The Pine River provides good opportunities for kayaking, canoeing, rafting, and power boating. There are no developed trails in this park. Visitors should use caution and be safe when adventuring out in the backcountry/wilderness area.